Memories are funny things. You may remember something completely random and unrelated to anything at a certain point. On the other hand, you may completely and utterly forget the name of your new neighbour. Then again, you might recall with perfect clarity the exact clothes you were wearing for your first interview. And forget what the heck you wore yesterday. Yes, memories are funny things indeed. I was thinking about England a few weeks ago. I was trying to see if I could remember Hoylake, where we were living before we moved here. As it turns out, I remember quite a few things. But I also realised that my memories of Hoylake were fading, and it was as if I was viewing things through a bit of a foggy filter. I can remember names and places. For example, Julian from Julian's Restaurant, or Nick (the Arsenal fan!!) the owner of Flavours, and his son Justin (the Aston Villa fan!!). Chok, the head waiter at the Golden Orchid, who always took Aditi on a tour of the kitchens as soon as she arrived, while Kay and I enjoyed a leisurely Thai meal. Oh, and 'Chocolate' Tom Sargeant from Sargeant's Chocolates. When my husband went to buy chocolates for me after I'd just given birth to Aditi, he said to Tom, 'you know my wife, of course, she's here every day!' To which Tom replied 'I cannot confirm or deny that sir, its a breach of client-chocolatier confidentiality' hehe. T'was a sad day indeed when he had to close down the chocolate shop and become a driving instructor instead. If you live in the North West of England, you've likely had Cheshire Farms ice cream. If you haven't, what the heck are you waiting for? Go grab some NOW. Yes, NOW! You can read the rest of this post later. 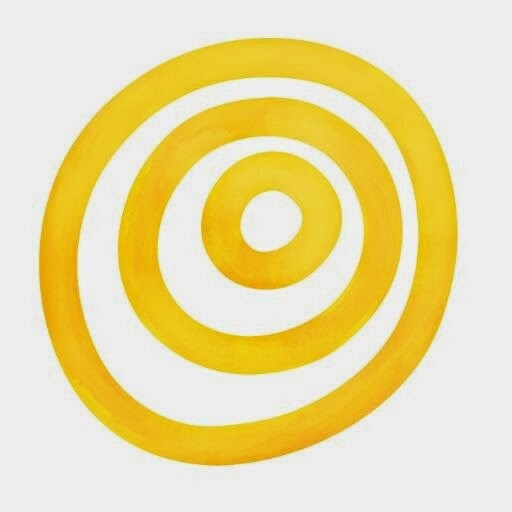 GO. NOW! Chocolate Tom sold this ice cream in his shop, as did the Carr Farms Garden Centre. Yeah, guess where I could be found most often then? Haha. I loved all their ice creams (and indeed, ate all of them too!) but the standout flavour for me was the coconut ice cream that I always had at the Golden Orchid, after a delicious Thai meal. 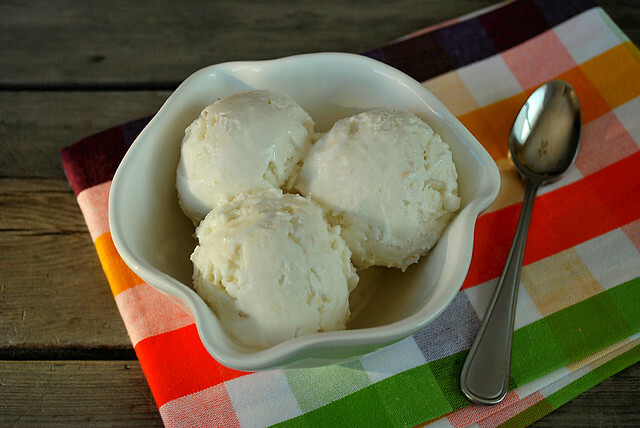 When Kathryn asked me for a recipe for coconut ice cream for a class, I knew immediatley that I would have to try and recreate the taste of the Cheshire Farms version. I started from scratch with this recipe. The egg based ice cream that I started off with was delicious, incredibly rich and creamy, but I felt that the coconut flavour in it was quite subdued. So I tried using cornstarch to thicken the ice cream instead. The trick, I guess, was the use of the coconut extract. It added that coconutty fragrance that seemed to be the one thing I always missed from the ice creams I'd made. I played with adding dessicated toasted coconut to the ice cream, but both Kay and I didn't like the sandy texture of it, so I decided to leave it out of the finished dish. Place the 1 cup half and half and the sugar in a heavy saucepan. Slake the cornstarch in the 3 tbsp extra half anf half cream, then add it to the pan. Heat gently until the sugar dissolves, then bring to the boil. Turn down and simmer for about 4 - 5 minutes, stirring constantly. Add the coconut extract and the coconut milk. Simmer for an additional 5 - 8 minutes, again, stirring all the time, until the mixture thickens slightly. Strain into a bowl. Chill until completely cold. Churn in an ice cream machine, following its instructions. This looks & must taste amazing! I certainly need to get myself an icecream maker! Any suggestions? I have the kitchenaid bowl that connects to my kitchenaid mixer. If I didn't already have a kitchenaid, I would have gotten the cuisinart ice cream maker. Whats with everyone and coconut this week? Ive already seen coconut ice cream, coconut rice, coconut cookies and then coconut thai curry! Your looks so amazing and yes i LOVE coconuts! I wish I was in north england now! By coconut extract do you mean the essence as in like in vanilla extract??? I think you thought great. Adding the essence does deepen the flavors. We have a local company here that makes amazing coconut icecream.. so never thought I would make one, but now I might. It's funny how you can forget places isn't it. I sometimes think back to places I've lived and find I can remember different places but not where they are in relation to other places i.e. how to get from one place in a town to another. I love the look of your ice cream too. Well one funny thing that I remember is that back in Greece we don't eat Ice cream at winter.. haha, seriously! Well this thing is starting to change but generally they don't consume ice cream at winter! We are going to have some this weekend.. Coconut Ice Cream..!!! Lillian, thanks. Let chat more at the dumpling party. Rebecca, me too. Its such a delicate, yet strong flavour, isn't it? Shoba, lol, this one wasn't planned. I made it for a cooking class I was working on, and it was so great, I had to blog it too. And yes, coconut extract like vanilla extract. You can get it in supermarkets. Mine was unfortunately imitation, but I know you can get natural extracts too. Ansh, haha. I never made ice creams in England. Cheshire farms was way too good mate. But this one is remarkably easy to make too. Sharmilee, thanks. It sure is. Eri, haha. If you know me and my blog, you'll know that I am a total ice cream addict. I can eat it anywhere and at anytime. In fact one of my ice creams was made when it was -45 here :) I hope you enjoy this recipe. Preeti, thanks! Love your space too. This sounds great - coconut is a great ice cream flavour. I've been spending a lot of time around Liverpool so Cheshire Farms is no stranger to me. I'd send you a parcel with a selection but I think it might just melt on the way. Haven't used the ice cream maker in a while ... 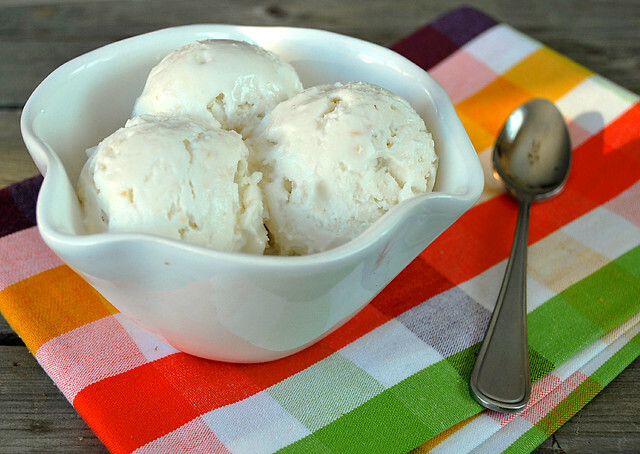 I am so intrigued by the idea of coconut ice cream! must try! ... but sweetened or unsweetened coconut milk? Damn, Phil, don't do this to me :( I miss their ice cream so much!!! Susan, unsweetened and the ones that are used for Thai or some Indian recipes. Try Chaokoh or Aroy D brands. Looks delicious. Is there any way of making it without an ice cream machine? Aparna, yes there is. After making the mix, chill in a fridge until cold. The place in a freezer safe container, and place in the freezer for one hour. Take out, and using a hand or electric whisk, beat well, scraping down the sides. Do this two or three more times on the hour, and then freeze overnight. Its time consuming, but the whisking helps stop ice crystals from forming, and the resulting ice cream will be much creamier. PS - I also meant, after whisking keep placing the ice cream back in the freezer to freeze a little more, before taking out and beating again. I can just imagine how gorgeous this tastes! super recipe! I'm the wrong end of the country so I'd have to make my own! 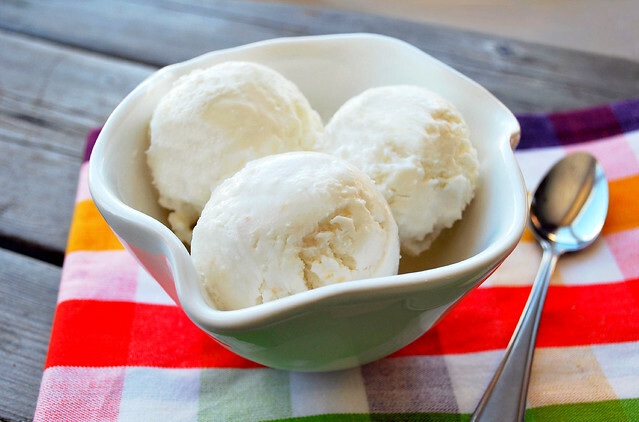 LOVE coconut ice cream, this sounds so simple to make without worrying you're going to scramble eggs in your custard either. I've just come back from another stay in Liverpool and I hunted down some Cheshire Farms coconut ice cream. 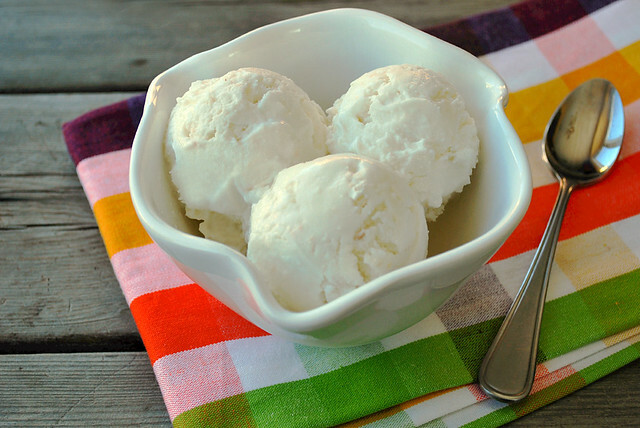 Homemade is always best, of course, but I've got to admit that it's a really good ice cream. I might never have tried the coconut if you hadn't recommended it (the mango and passion fruit has been my downfall), so thanks for that.